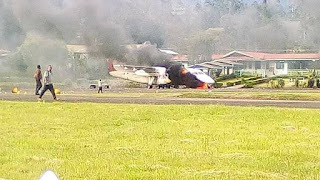 Several buildings including, court houses, education office, health office and an Air Niugini Dash 8 aircraft have been set alight in the Southern Highlands Provincial Capital Mendi, Papua New Guinea when disgruntled supporters of election petitioner Joseph Kobol heard about the dismissal of the election petition by the National Court. The National Court dismissed Joseph Kobol’s petition, disputing William Powi’s declaration of 27 September 2017 as the Southern Highlands Governor. A case of “premature declaration” under “special circumstances,” Joseph Kobol, one of the two petitioners in this seat filed the petition, asking the court to void Powi’s declaration and allow the scrutiny process to be completed with the candidate who gains absolute majority to be declared. Two objection motions were filed by Powi and the Electoral Commission challenging the competency of Kobol’s petition. National Court today dismissed the petition because Kobol’s reliefs sought were not under section 212 of the Organic Law. 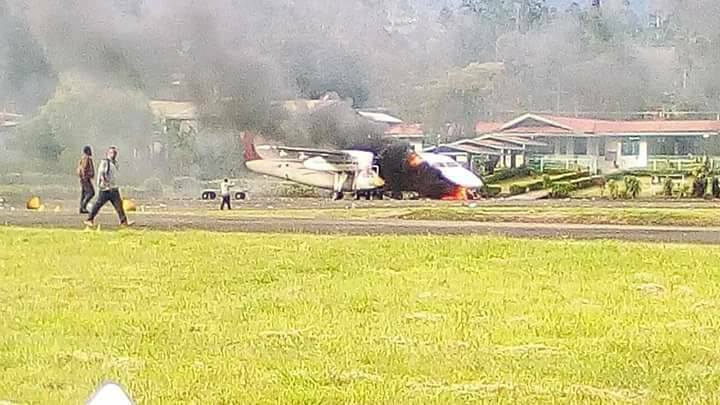 Meanwhile, Air Niugini has confired that that one of their aircraft, a Link PNG DHC -8 aircraft was damaged during civil unrest at Mendi airport, Southern Highlands Province this afternoon following an election petition decision. The airline said the aircraft has suffered damage when rioters invaded the tarmac, and National Airports Corporation(NAC) has also closed the airport. Prime Minister Peter O'Neill has condemned the actions of the supporters and said that his cabinet will convene a meeting tommorrow (Friday) to declare state-of-emergency in the Province.